The Padua large chrome 15 light lead crystal column floor lamp, from our prestige lead crystal lighting range, a spectacular feature floor lamp of the utmost quality. Featuring a circular polished chrome base, central support and five-tiered frame, overlaid with rows of coffin drop crystals. The tiers decrease in diameter towards the bottom, each overlaid with four rows of heavy crystal coffin drops that create the most wonderful lighting effect. The lamps are spaced within the crystal curtain at different levels to illuminate the complete fitting, ensuring that every crystal refracts the light, creating a glimmering effect. 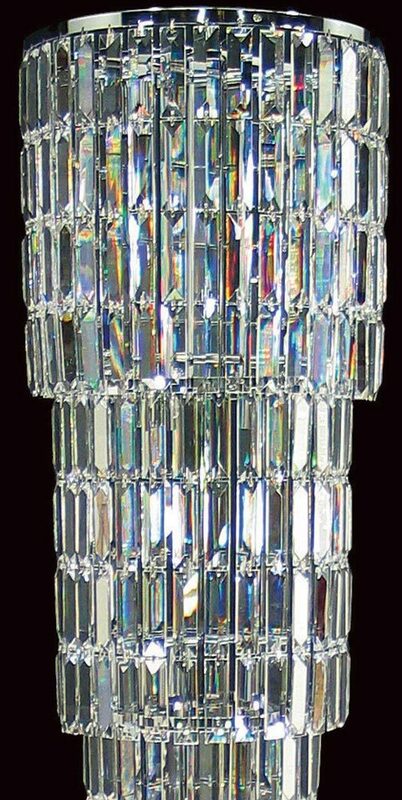 A large, spectacular polished chrome framed fifteen-light lead crystal floor lamp dressed in the finest crystal coffin drops. Five tiers of crystal reflect the light all the way to the very tip of this exquisite hallway feature. Suitable for large rooms and hallways. This sophisticated crystal floor lamp is part of our prestigious lighting range that features style, quality and impeccable detail. Please note that this fitting weighs in at 32Kg and will require careful handling. Other fittings in the Padua range can be viewed by scrolling down the page and include seven and fifteen light pendants, and five lamp wall light.